‘Some days are so windy that even angels lose their balance from the top of City Hall’, so begins the tale of The Flying Orchestra. Their schedule is a very busy one that includes; symphonies, solos, concertos and sonatas. They play at regular times and for special occasions. This is a spectacular book about the music all around us, if only we care to stop and listen. It pairs music with events and emotions and may help some see things in a different way. 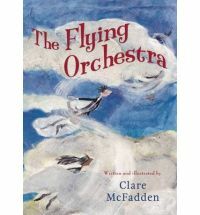 McFadden’s illustrations are wonderfully emotive, pairing perfectly with the text to put in your hands a simple yet profound and whimsical story. Simply beautiful.